So, my sister and her family are moving to AFRICA on Friday!!! I have such mixed feelings about this. Really, I do. I am SO excited that they will be able to do what they are called to do (help set up business, make them (businesses) stronger, orphan care, after school programming), but I am going to miss them SO much. You can learn more about them here. I thought I had better whip up something that my nieces can use on the plane so, here it is! This is the front of the tray cover. I used laminated fabric (Amy Butler, LOVE her fabric) as the base covered with multipurpose weight vinyl. I edged the vinyl so that you could easily slip a coloring sheet, game, maze, etc under and use dry erase markers to color it. In order to make it "stretchy" I used mesh, just like football uniforms, for the back side. I doubled up the fabric to make a pocket to hold small parts, like polly pockets when the try needs to be up. I then quick whipped up a bag to hold all the parts out of some fabric I had in my stash. Using printed out games from the internet I was able to find the Dot Game that my sister and I played when we were younger. Oh, I should add that my nieces are 4 1/2 & 3 but I think they can handle it with help of their parents. I also printed off some coloring sheets (they are so into fairies right now) that they can color in. The great thing is that they will be coloring on top of the vinyl so the coloring sheets will last forever. I found great 2 sided dry erase markers at Target, they come in an eight pack so I just split them between the two girls. I also used my Stampin' Up! big shot to cut out a piece of wool felt for an eraser (that is what the scallop square is in the picture). In this picture you can see the checker board that I printed and the flower checkers that I made using a Stampin' Up! Sizzix die and the big shot. You can also see the pocket that I attached, this will hold the markers and the eraser when the tray cover is in use. I just used some left over fabric to make the pocket. Ya, think you want to make one, do you??!! Here is how to do it, fairly simple for the most part I would say. Cut your Clear Vinyl to 9 x 24 inches. Cut two strips of laminated fabric to 2x24 inches. To make the edging fold the long strips of laminated fabric in half, burnish, and in half again. This will give you 1/4 edging with a nice clean folded edge. Stitch to the edges of your vinyl on both sides. I did a double stitch about 1/16 of an inch apart for extra strength. Hem edge of the laminated fabric so you have about a 1 inch hem. Double Stitch. Hem the edge of the mesh (top, not sides) I did a double roll hem (I think that is what it's called) for a little added bulk. 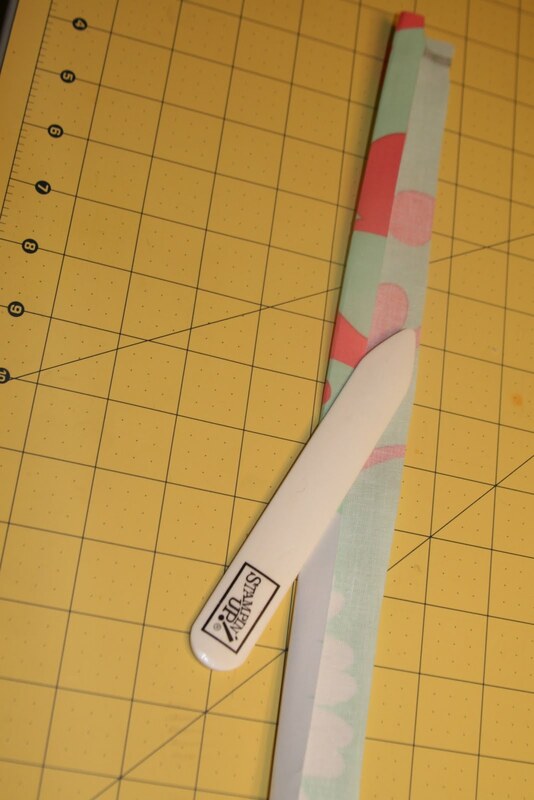 Attach the edged vinyl to the laminated fabric by stitching the sides together. Then attach the mesh to the fabric by double stiching and trim the excess bulk. The end result back side! The size should end up to be approx 9 inches x 15 or so. Allow enough room so that the tray mesh will stretch (this seems to be able to stretch at least one inch. The average airplane tray is 9 1/2 by just over 16 inches. Hope fully this all makes sense! Let me know if you have questions. Halloween is just around the corner! 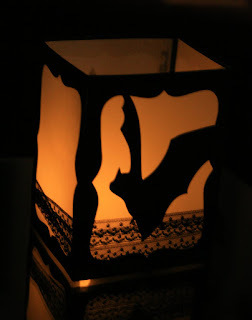 Today's post consists of three projects: A luminary, candy jar, and card. 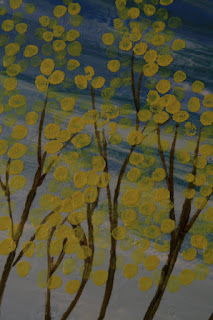 FYI: I did create a tutorial for the luminary in the post below this one. 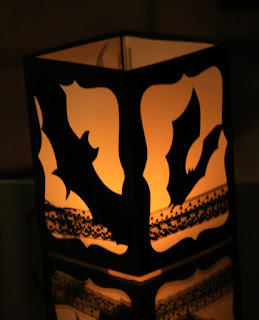 Using the bats from the Spooky Things Decor Elements out of the Holiday Mini Catalog I made this luminary. (Remember the great white Trick or Treat Pumpkins? I'm still using up the same sheet of decor elements) This project calls for the 3 bats that are included in Spooky Things sheet. 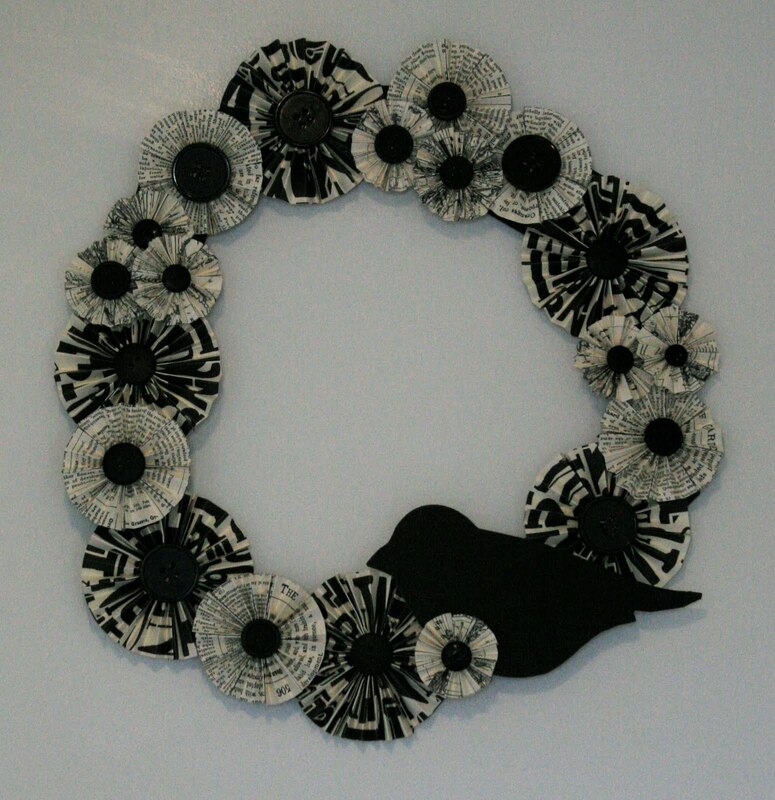 I also used some Raven Lace to add a bit more pizzaz to the project. This card is SO simple to make. All I did was simply punch out 9 bats out of the halloween paper in the main SU! catalog, attach with a mini glue dot, fluff up the wings, and stamp "Happy Halloween" in Basic Black in the corner. I love the Tiny Tiny Wishes stamp set that "Happy Halloween" came, it truly is my go to stamp set. 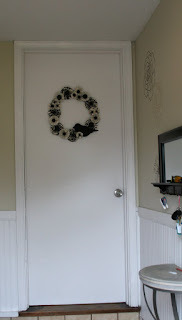 I have to say that this Spooky Spider was the first Decor Element I ever tried & I still love it 3 years later! I found the jar at Target, I do believe they still sell them in some of the bigger Targets. I decided that my jar needed an updated tag. I used the bat punch and the halloween decorative paper for this one. All I did was punch out the black paper, layered it onto the spooky paper and trimed. For the finishing touch I added a strip of the polka dot paper at the bottom. I tied the tag on with some of that great Raven Lace. 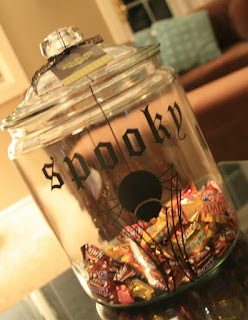 Normally, there would be a lot more candy in this jar, but I couldn't bring myself to fill the jar quite yet. 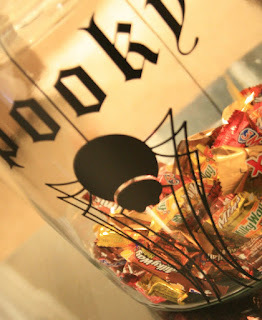 As it is I had to kick my hubby out of the candy while I was setting up for pictures. This jar is quite large, I think it holds at least 5 smallish bags of candy. That's a LOT of sugar! So, you want to make one of those great luminaries? Well, today is your lucky day! 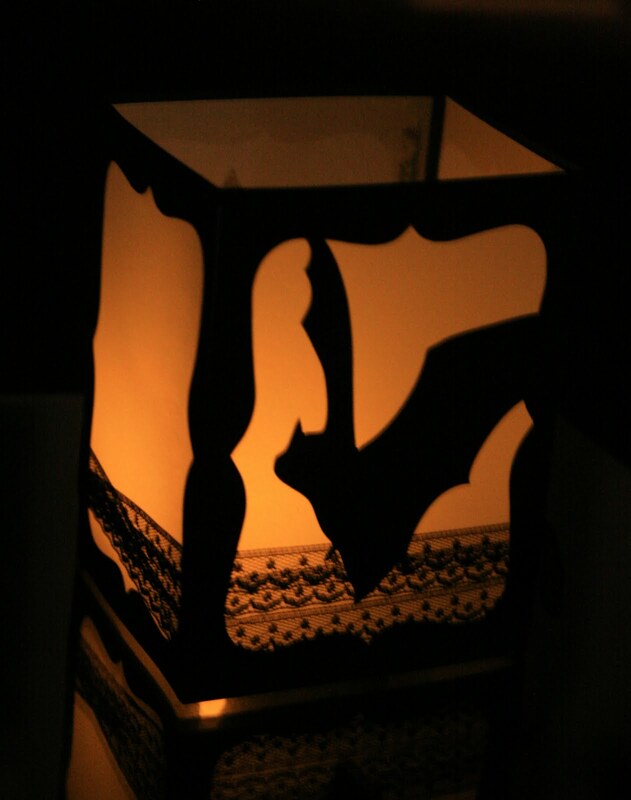 I made one of these luminaries for my Stampin' Up! workshop hostess today at her workshop. The project went over so well I thought I would come home and whip up another one. Cut the Basic Black Cardstock in two 5 1/2 x 12 inch pieces. Fold in half. Place onto top note die approx 1/4 from edge of die. "Sandwich" up and run through the Big Shot. Place tip of Top Note cut out even with the inside "rail" on your paper trimer (as in picture) and score. Do this for both ends of the cut out cardstock. After scoring trim "flap" to 1/4 of an inch. Apply stick strip on the inside near the cutout in order to hold your vellum cardstock on. Layer Cardstock on AFTER applying your bats to the vellum, one side will be blank. 3 bats, 4 sides (sorry no picture for that step). 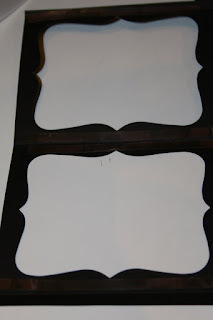 Apply sticky strip to the 1/4 inch lip on one of the sheets of black cardstock. Cut off the flaps on the other black cardstock piece. Attach the two pieces together in order to make a square luminary. Next, I took a very generous piece of Raven Lace and wrapped it around the luminary 3 times and tied off in the front in a knot. That's it! Now, that wasn't so painful to do was it?! 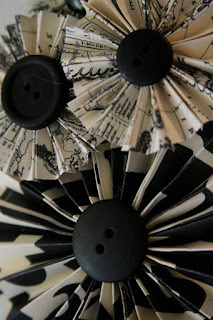 I ran across a fun paper fan wreath last week on Inspiring Creations and thought I totally have to make it! So I did. This project only took me a couple of evenings to create but could of been done easily in one sitting. I followed all the instructions on Inspiring Creations (click here) but switched them up just a bit to use mainly Stampin' Up! products. I went ahead and used SU! 's new Newsprint 12x12 designer paper. Love that paper and I only needed 3 1/2 sheets for this project. Do you recognize the bird? Think for a second, all I did was cover him with some Basic Black paper...... Remember the Chipboard bird albums that SU! sold last spring? Yep, that is so him! The best thing is that there are some on the Clearance Rack right now. To find the Clearance Rack head over here to my website, click shop now, and then clearance rack! Here is a "real life" shot. I did do a "little" editing and cropped out the pile of shoes and boots, why oh why is there a pair of boots out already? Up close of some of the fan flowers. LOVE that paper! 1 Wire Hanger or 2 if your dry cleaner gives you those wire/cardboard kind. The time has finally come to show you what I have been working on for many, many hours recently. I have the honor of entering and showing my artwork in ArtPrize 2010. Click here for more info on ArtPrize. For this years entry I decided to try my hand at Encaustic Wax. 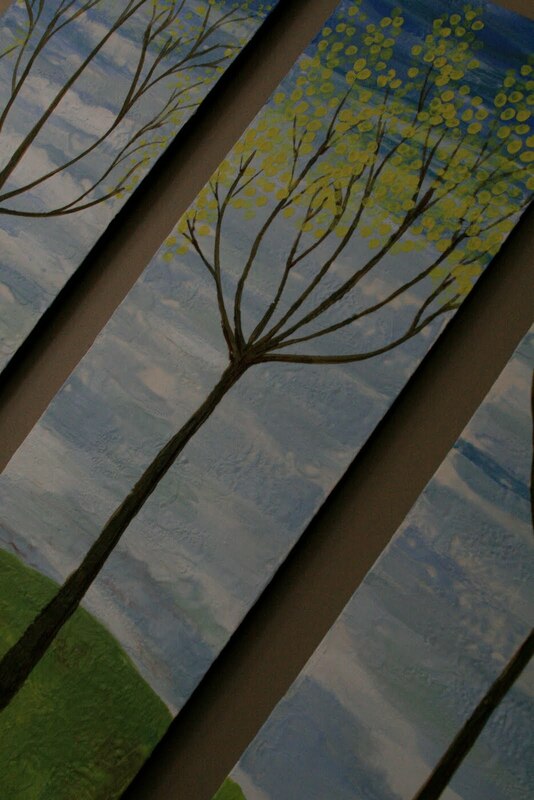 Encaustic wax is basically beeswax, resin, and pigment mixed together and heated. I used my good old electric skillet to do the job. I should add that I really don't cook so don't worry about me not being able to use it for "food" use in the future. 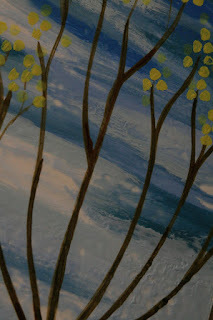 I applied the wax in layers with a paintbrush (a real one, not a synthetic one) in between the wax layers I would heat the painting up with my good 'ole Stampin' Up! heat gun to fuse the layer together. 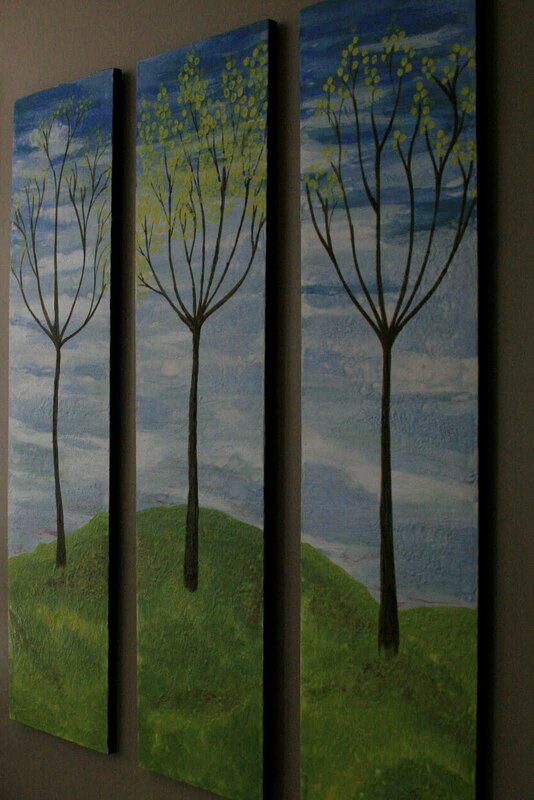 The painting is made up of three canvases each 12" x 48". 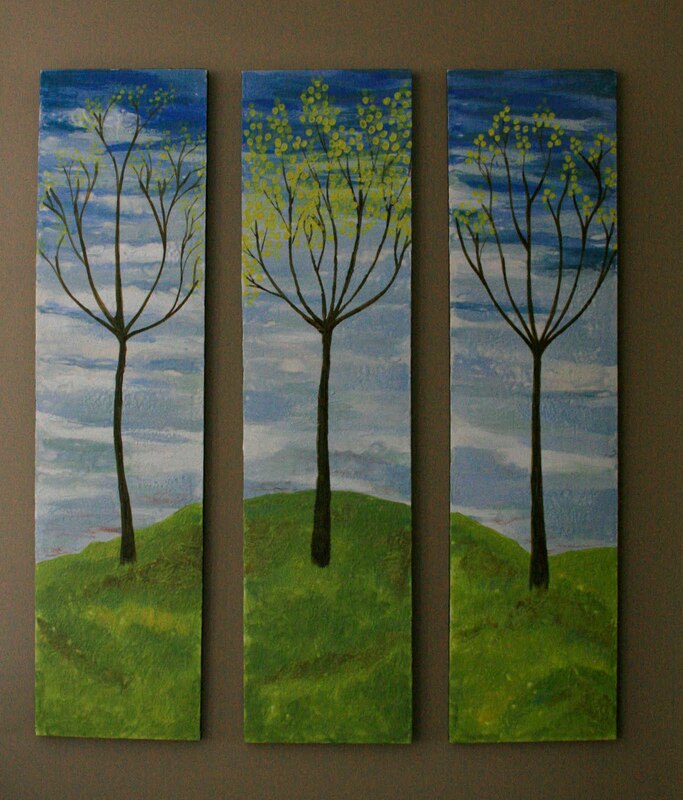 The painting was created so it could hang either all three pieces together, like in the picture, alone, or even vertically. I really like pieces that let the "owner" decide how they should go. There is no right or wrong for this painting. Here is a close up of the grass. You can see the different layers and texture that the wax allows me to create. I also used some wax medium to make a glaze with the pigmented wax for even more texture. 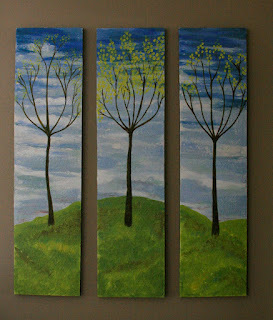 Budding tree tops. Can you see the depth that I was able to create by using a glaze technique. The good 'ole spring sky. 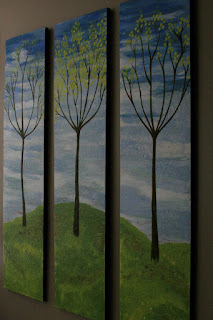 Side view of the paintings. If you are in the Michigan area you can see my work at the Ottawa Tavern in Downtown Grand Rapids, on Ottawa st, in the Water's Building. Enjoy! I know that I haven't posted in way too long again. I have been working like a crazy woman around here and will hopefully be able to revile my project in the next couple of days. Some of you many know, or not that I have my BA in Fine Art. So, last year when Grand Rapids (where I live) hosted that first ArtPrize international art competition I jumped on the chance to exhibit my art. I have been on a "fine art" break for many years, well since 2001 to be exact. I'm not saying that the art I create is fine art in any sense of the word. I tend to have a very modern folksy style. Soooo, I have the honor of being able to exhibit a piece again this year. If you are in the Grand Rapids or Michigan area come on down and check me out at Ottawa Tavern (downtown behind Kendall College of Art and Design). If you would like to find out more about ArtPrize click here. I will post up some pictures here sometime over the weekend for you all to see.